We offer the best prices on the best products - plus fast turnaround! The Green Flooring Company is proud to be Boulder's premier source for both installation and selling flooring in Boulder, CO. Having served the area and surrounding states for over 20 years, our original owner-operated environmental flooring company in Colorado has left our mark on many homes. We offer a range of eco-friendly flooring including cork, bamboo, and sustainable flooring in Boulder, CO. We also offer all types of floor refinishing and specialize in eco-friendly oil wax finishes. Stop by to view our selection of bamboo flooring in Boulder, CO, and take advantage of our quality craftsmanship, friendly service, and environmentally friendly flooring materials. Our goal is to simplify your experience when purchasing and installing a new surface. That way, you always turn to us for your future flooring needs. We’ve even expanded into wall and ceiling installations, so we can actually be the company you call for any interior renovation. At Green Flooring Company, we feel you should enjoy the process of making your home more beautiful, not just the end result. • In-home consultation for your flooring, wall, and/or ceiling purchase. • Sanding, staining, and finishing your new or existing floor. • No obligation estimates for your flooring needs. • Flooring, wall, and ceiling installation using the finest European craftsmanship. We will install materials sourced by us or the customer. From free estimates to in-home consultations, there’s a lot to love about the way we serve our customers. We allow you the opportunity to view samples of the material you like and are happy to meet or beat competitor prices. You’ll also find all types of finishes, including eco-friendly oil wax finishes, and can invest in custom staining for a personalized look. Environmentally conscious customers love our bamboo because it’s unmatched in terms of eco-friendliness and natural materials. Others love it for its ease of care; a broom or vacuum is all that’s needed to maintain that special shine. 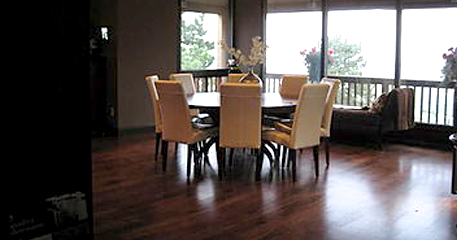 The durability and style of this flooring is similar to hardwood yet unique in its own way. Bamboo boasts a higher level of water, warping, and stain resistance than its other wood counterparts. During your in-home consultation, we’d be happy to discuss the benefits of bamboo and the perfect spaces for this special surface. We’re fully invested in your renovation success and are ready to you determine exactly what that means for your home. Longmont, and Fort Collins, Colorado, and the nearby areas.